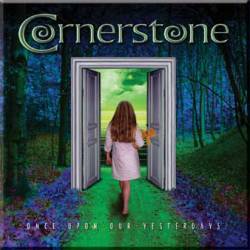 Once Upon Our Yesterdays is the third CD by British/Danish melodic hardrockers Cornerstone, the band founded by singer Dougie White (ex-Rainbow, Malmsteen) and Stephen Mogensen (ex-Royal Hunt). This time, they have chosen a very dynamic opener called Welcome To Forever which makes you think that this could be a hammer album. Unfortunately on the second track (When The Hammer Falls), the hammer and the musical level start to fall because the song writing seems quite uninspired. Passion To Warfare underlines Cornerstone's passion of classic rock and seventies rock elements which are generally a big part of their music. Maybe this album isn't too bad for this kind of music, but Cornerstone shy the risk to experiment. Many songs on this album could also have been from their two first CDs Arrival or Human Stain. And one thing on hardrock album I always have horror about are the so called ballads or mid tempo song: Man Without Reason, Some Have Dreams and the title song are three very weak songs on this CD which remind me of Scorpions ballads. I'm afraid that Cornerstone have reached a dead end street with this third record.